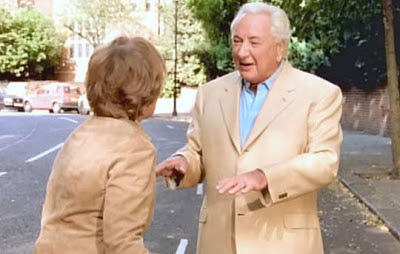 In 2002 Michael Winner started to appear in TV advertising for E-Sure. Essentially Winner crashes into 'the back of' someone's new car. Terrible dialogue and bad acting lent a kind of charm to the production, but the catchphrase that Winner used throughout the ad, ‘Calm Down Dear’ began to live outside of the 30-second spot as it permeated everyday life. I remember the phrase being used repeatedly in our part of the office and Google now returns me 129,000 results against an exact match search on the ‘Calm Down Dear’ phrase - indicating just how much discussion the ad prompted! "The team had Michael Winner on the phone. The ‘calm down dear’ commercials have apparently sold loads of insurance policies for esure. All the Ads were shot outside Michaels house. He used to be a really bad driver; he once crashed through some railings and into someone’s living room. He has written about Chris in his Times column, full of lots of praise apparently. It’s out Sunday if you’re interested. " "Chris had gained an exclusive preview of the new Michael Winner advert. The clip featured a carpet spillage and Michael saying 'Calm down dear! We can claim for it on our insurance policy!' The team thought it was very funny. The advert will be shown during tonight's episode of The Bill. Chris had to play an advert for digital TV featuring Dave Pearce and an old woman. When it had finished Chris said 'What the hell was that?' Dave replied in a Michael Winner voice 'It's a commercial!' The team made personal commercials for the listeners in honour of the genius that is Michael Winner and his two new commercials being aired tonight. The only criteria was that each one had to have the ‘calm down dear’ phrase in it. " "The team recieved some presents from esure for plugging them so much. They had a stress ball which when squeezed said 'calm down dear' and a specially made cartoon saying 'calm down dear, it's the Chris Moyles Show' "
"If Winner was made to look a touch silly, he probably wouldn't mind. For nearly three years now, he has been the star - and director - of a series of adverts for insurance company Esure which have been as irritating as they have been effective. Whether crashing a car, or dressing up in drag and standing on a chair, Winner showed no reluctance to make himself look a bit foolish for the sake of publicity. And the tactic has worked: the company claims it has reached a million policies in less than four years in business." "They [the Michael Winner E-Sure ads] stand out for their awfulness, but that can be a good tool for advertisers, as long as not many other people try it. If everyone tried it, eventually everybody would turn their televisions off. They are very irritating, that's certain, but in this case Michael Winner managed to pull it off." Ultimately an ad campaign that felt 'homemade' and irritated a lot of people, managed to become an (ironic?) multi-media property as the catchphrase quickly entered popular culture in the process turning an insurance start up into a household name.